habermann materials – The Original is your trump! Discover your ace for extreme conditions! The name HABERMANN stands for 80 years experience with the hydraulic transport of solids and is a major pioneering company for the development of mixer tools for concrete mixers. With the introduction of the original brand Hawiflex® more than 50 years ago, HABERMANN established the brown mixing blades at numerous concrete plants in Germany, Europe and beyond Europe‘s borders. All parts have the label Original Hawiflex®. Our brand has often been copied in accordance with the misleading motto of „all browns are the same“. Yet, we have been able to further extend our technological advantage and to strengthen our market-leading position. Hawiflex® products have been success fully used in ready-mixed concrete plants, precast concrete plants, in the production of concrete blocks, concrete pipe production and in the roof tile industry. A major focus of our supply range is on mixer tools for virtually all common makes of concrete mixing plants. The extensive spare parts range is available for ring-pan mixers, single and double shaft mixers and planetary countercurrent mixers. In order to ensure the short-term security of supply to the customers, the articles are stocked by main dealers in many European countries. The main dealers are supplied from our large main warehouse in Witten/ Ruhr, where habermann materials concentrates on the core business mixer spare parts and custom made wear resistant plastic parts. ISO 9001: 2015 – the latest evidence for consistently lived quality management! With our current certification according to DIN EN ISO 9001:2015 we confirm as habermann materials GmbH that we will always meet or exceed theexpectations of our customers in the manufacturing and sale of molded parts and coatings made of plastic for industrial operational purposes. 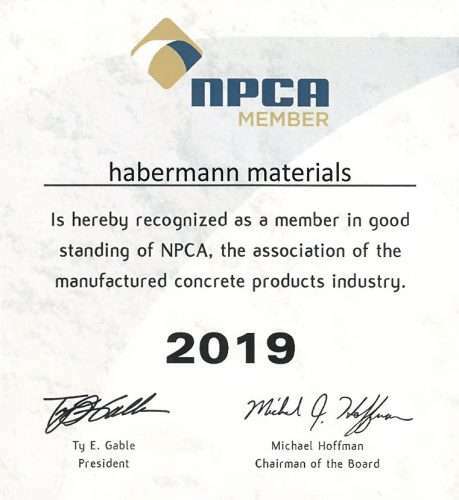 habermann materials has been a member of the NPCA (National Precast Concrete Association) since 2018. The National Precast Concrete Association is an organization that offers support, leadership, educational opportunities, industry connections and information. The NPCA is a non-profit trade association representing manufacturers of industrially manufactured precast concrete products and companies providing equipment, supplies and services to industry.